I have been wanting to try this pattern for ages - I finally did it. Calorimetry number 1 made with ella rae classic print yarn. 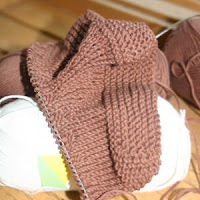 I've made a baby's ear cozy hat from this skein and now a calorimetry. I still need to weave in the ends, wash it and put on the buttons. 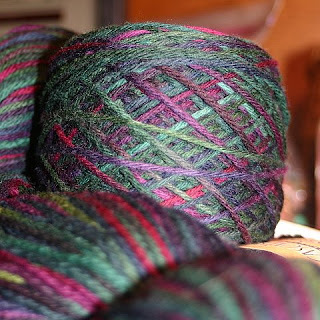 Calorimetry number 2 was made with one skein of Noro Kureyon . 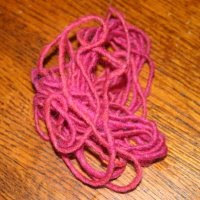 This is how much yarn I have left...Like the other one, I still need to wash it, weave in the ends and sew on the button. 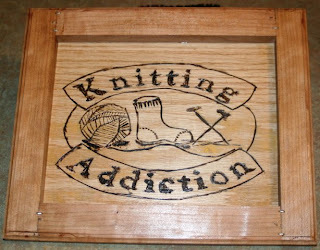 I'll be teaching this at a class at The Tangled Skein this spring. It's official - I even have a sign! I finished DJ's 2nd sock yesterday while knitting with friends at The Tangled Skein. It's so nice to have our weekends back now that the local hockey is over for both boys! I found this pattern online here for Baby Moc-a-Soc's and just couldn't wait to make them. I'm sure their future recipient will reveal themselves to me one day.I'm using Dalegarn Dale of Norway yarn in Stork (100% cotton for easy washing) in a brown and a cream/white. I have two 50 gram (180 meter/195 yard) balls of brown and one of cream/white.